A Caribbean vacation is a dream come true, especially when you come to Belize. But the best way to enjoy this coastal canvas is to charter a catamaran to ride the waves into the sunshine with the sea breeze sweeping your cares away. 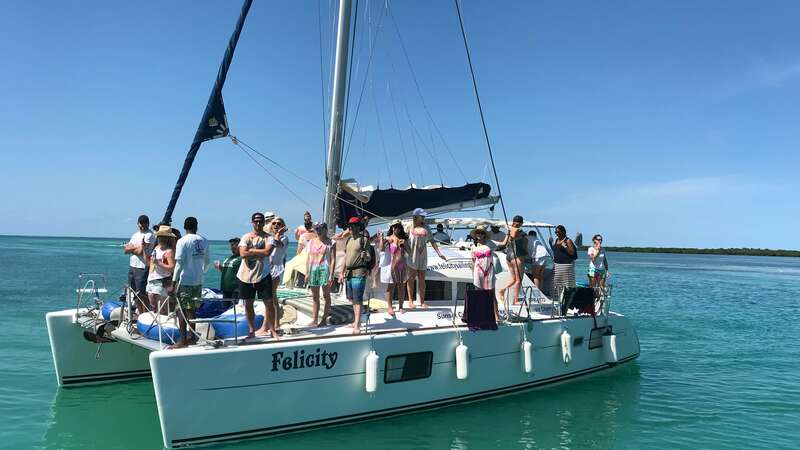 Whether you’re vacationing with family or someone very special, there’s no better thrill than chartering a catamaran with Felicity Sailing. Highly-rated, our charters are completely customizable to create your perfect vision for the day. Choose a sunset cruise with the family, or make it romantic for just the two of you. Plan a days-long retreat with your favorite friends, or join in on a group tour. However you want to hit the high seas, Felicity Sailing is on board with you. It’s more than just being on a boat. Felicity Sailing crews take you to where your dreams come true. Snorkel in the beautiful sparkling waters, unwind with tropical libations, visit immaculate beaches, reel in the catch of your life, and embark on land excursions that take you through rainforests and Mayan ruins. Whatever you want to see, Felicity Sailing can make your vision of the perfect vacation a reality. With expert commentary on everything you see and do, delightful food, 5-star accommodations on our luxury catamaran, and a relaxed atmosphere, sailing with us is the ideal way to create the vacation of your dreams. Plan an overnight adventure or a shorter day trip any way you like it. Food, drinks, and pure fun in the sun on the open water are exactly what you need to escape the ordinary. Remove yourself from the throngs of tourists and have an experience all your own. Authentic Caribbean hospitality, a wealth of knowledge of the area, expert yachting and trip planning skills make Felicity Sailing the only catamaran charter choice you’ll ever want to experience. Planning a trip can be stressful, but planning it with Felicity Sailing will be the most effortless way to an incredible vacation that you’ll never want to end. In the capable hands of husband and wife duo, Horace and Sara, along with their crew of expert seafarers, you’ll be able to enjoy a safe, carefree experience on and off the water. Isn’t that what vacations are supposed to be all about anyway? Book a catamaran charter with Felicity Sailing today. Choose what you want to do, how long you want to be on board, and let Sara and Horace make your stay in Belize blissful. Ready for the vacation of a lifetime? Discover the Caribbean by Catamaran with your Family or Friends today! Contact us for more information.